IOGEAR’s $99.95 Thunderbolt 3 to Dual 4K DisplayPort Adapter lets you connect up to two DisplayPort monitors (one 5K or two 4K @ 60Hz) through a single Thunderbolt 3 port on your iMac or MacBook Pro. Basically, the adapter transforms a Thunderbolt 3 port into two individual DisplayPort video outputs without the need to purchase a pricey graphical workstation. It’s compact, so it’s easy to stow and take on the road. And it’s bus-powered, so there’s no need for an external power supply. 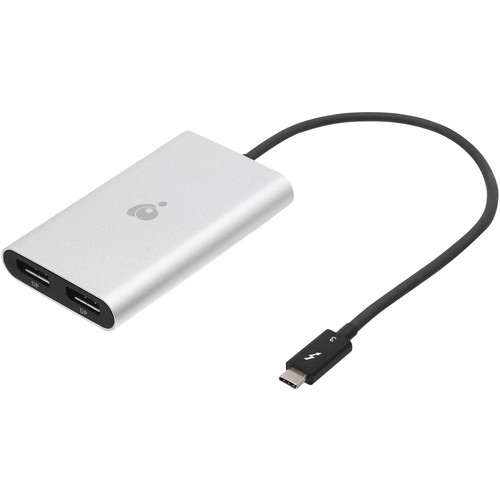 The Thunderbolt 3 to Dual 4K DisplayPort Adapter is a solid solution for extending a MacBook Pro to maximize the display of graphic-intensive professional applications such as graphic design, video editing or presentations in small offices or while traveling. Plus, all consumers can connect their 4K or 5K displays to a laptop for gaming and content-streaming applications in their homes or dorm rooms.